With U.S.-Pakistan relations in the deep freeze, former Pakistan President Pervez Musharraf and American officials called Thursday for a thaw. "Blame games, rigidity, arrogance, insensitivity to each other's national interests is certainly very counter-productive," Musharraf said in Washington. "It definitely saddens me to see the deteriorating Pakistan-United States relations," he said in a speech at the Woodrow Wilson International Center. Twelve weeks have passed since American commandos killed Osama bin Laden inside Pakistan, an event that dramatically widened the rift between the two countries. 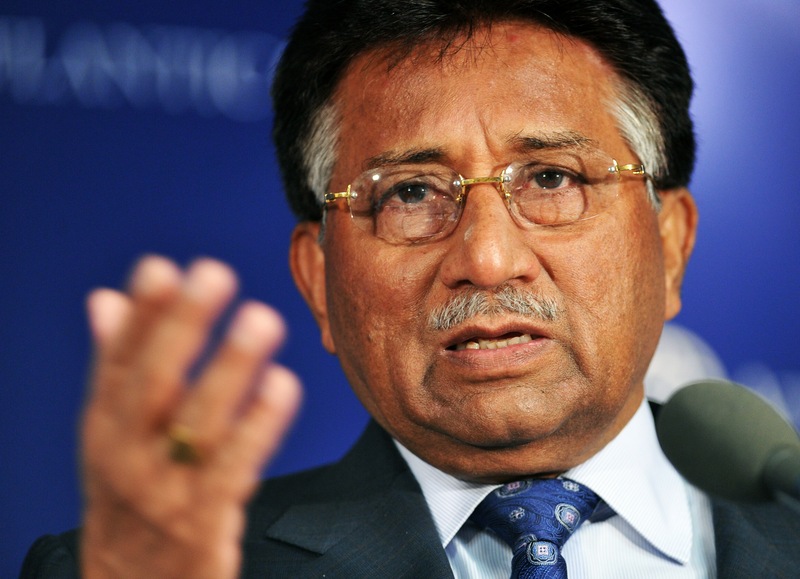 Musharraf denied he knew during his time as president or later that bin Laden was hiding out in Pakistan. "Whether one believes it or not, let me say with confidence, I did not know," he declared. He suggested that it was negligence and not complicity of the Pakistan government that allowed bin Laden to stay there undetected. "If there was complicity this is very, very serious indeed," Musharraf said. "I think the UN and the United States have all the right to be against Pakistan if it ultimately comes to believe that ... people were hiding him, people were complicit in it," Musharraf said. The former president and general, who has been living in London, pledged to return to Pakistan next March for a political comeback in 2013, in what he called "the mother of all elections." David Petraeus, making his way home from Afghanistan where he was commanding general and soon to start his new job as CIA director, reportedly told a Paris audience yesterday he also is worried about relations with Pakistan. He just completed a visit there and said the relationship is at a difficult stage but the U.S. must continue efforts to work with Pakistan, recognizing what it has done in the fight against terror. Meanwhile in Washington, top U.S. military leaders told senators of their concerns about Pakistan. The soldier poised to take over as chief of staff of the Army, Gen. Ray Odierno, said militants hiding out in Pakistan along the Afghanistan border are a major security challenge facing the United States. Adm. James Winnefeld, tapped as the next vice chairman of the Joint Chiefs of Staff, said Pakistan must do more to crack down on insurgents like the Haqqani network. "Pakistan is a very, very difficult partner and we all know that. We don't always share the same world view or the same opinions or the same national interests," Winnefeld told the Senate Armed Services Committee. "I think we need to continued pressure on Pakistan using all elements of pressure that we're able to apply to what really should be a friend to get them to realize that the Haqqani network poses a threat to their own country and to take the steps that we've asked them to take." Former congresswoman and Wilson Center director Jane Harmon said both the United States and Pakistan have made mistakes and miscalculations. "Nothing is irreparable and this relationship has got to be fixed," Harmon said after Musharraf's speech. "I think some tough love is required, I think there needs to be a more honest and straight relationship," Harmon said. "The Pakistanis have grievances, but we clearly have grievances too."